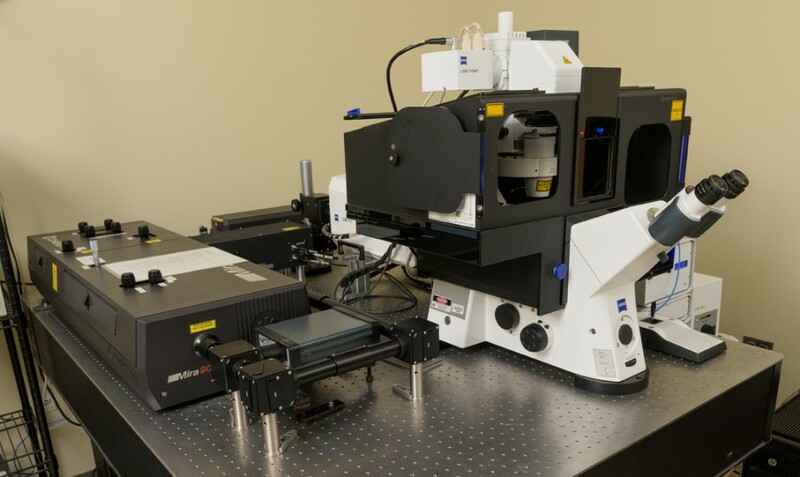 The LSM 880 microscope is a fully automated multimodal microscope that can be used for confocal, spectral, and multiphoton excitation imaging. The Airyscan detector enables super-resolution and high speed imaging. The LSM880 is fully equipped for live-cell imaging. It has an environmental enclosure (temperature, humidity, and CO2 control) and z-drift correction to maintain samples at the focal plane over time. -Spectral imaging with linear unmixing. It can be used to remove background autofluorescence or for multicolor imaging when spectral overlaps between colors cannot be separated with standard confocal microscopy. -Multiphoton excitation microscopy. It can be used to image up to 10x deeper than confocal microscopy. -Super-resolution imaging. The Airyscan can provide a 2-fold increase in resolution compared to conventional confocal microscopy. -High-speed imaging. The Airyscan detector can be used to image 4 times faster than the confocal mode (up to 20fps at 512*512). The 880 is also equipped with a piezo-electric stage for high-speed acquisition of z-stacks. -Confocal reflection microscopy. It can be used to image collagen fibers and surface microtopography. -Fluorescence Correlation Spectroscopy imaging. It provides quantitative data on concentrations, diffusion coefficients, molecular transport and interactions. -Tile scanning to image a large field at high resolution. -Live cell imaging thanks to the environmental enclosure. Objectives: 10x/0.3, 20x/0.8, 40x/1.2 W, 40x/1.3 Oil, 63x/1.4 Oil – more objectives are available as add-ons. Laser lines: 405nm, 458nm, 488nm, 514nm, 561nm, 633nm, 680-1080nm. Detectors: a 32-channel ultra-sensitive spectral GaAsP PMT (Gallium Arsenide Phosphide PhotoMultiplier Tube) detector (i.e. ChS in Zen) which is ideal for spectral imaging, two multi-alkali PMT detectors (Ch1 & Ch2), one transmitted PMT (T-PMT) for contrast imaging (Bright Field, Differential Interference Contrast, Phase), and one GaAsP Airyscan detector for super-resolution and fast imaging. The LSM 880 microscope is a fully automated multimodal microscope that can be used for confocal and spectral imaging. The Airyscan detector enables super-resolution and high speed imaging. Objectives: 5x/0.25, 10x/0.3, 20x/0.8, 40x/1.2 W, 40x/1.3 Oil, 63x/1.4 Oil. Laser lines: 405nm, 458nm, 488nm, 514nm, 561nm, 594nm, 633nm. 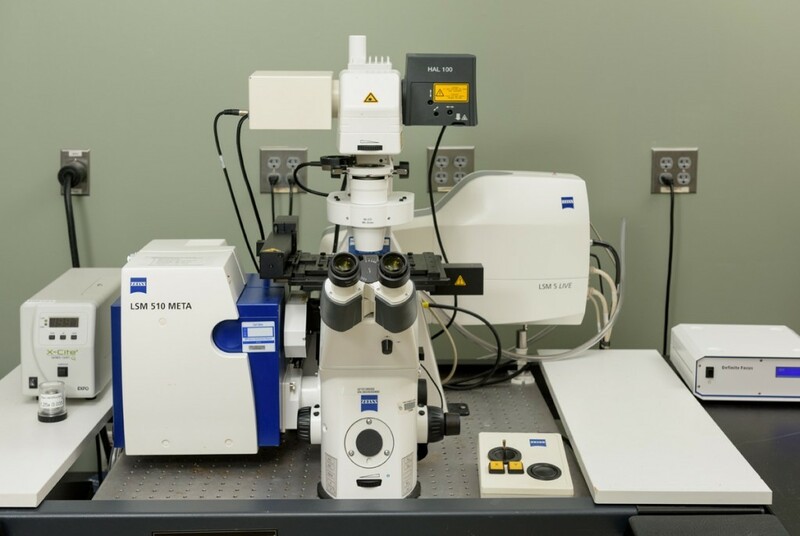 The Zeiss LSM 780 is an upright confocal (objectives are above the sample) that enables confocal, spectral, and multiphoton excitation imaging. The non-descanned detection system can be used for two-photon excitation fluorescence or detection of second harmonic generation (SHG) in the forward and reverse directions. The 780 is particularly well-suited for intravital imaging of small animals. -Multiphoton excitation microscopy. It can be used to image up to 10x deeper than confocal microscopy. The upright configuration, non-descanned detection system and the Z-deck add-on are ideal for intravital imaging of small animals. The system is also ideal for reverse and forward detection of second harmonic generation (e.g. can be used to image collagen fibers). Objectives: 10x/0.3, 20x/0.75, 40x/1.2 W, 40x/1.4 Oil. Other objectives available in the room: 20x/0.6, 20x/1 W, 40x/0.8 W, 63x/0.9 W, 63x/1.4 Oil. Laser lines: 405 nm, 458 nm, 488 nm, 514 nm, 561 nm, 633 nm, 690-1040nm. Detectors: a 32-channel ultra-sensitive spectral GaAsP PMT (Gallium Arsenide Phosphide PhotoMultiplier Tube) detector (i.e. ChS in Zen), two multi-alkali PMT detectors (Ch1 & Ch2), two non-descanned GaAsP PMT detectors, and one transmitted PMT (T-PMT) for contrast imaging (Bright Field, Differential Interference Contrast, Phase). 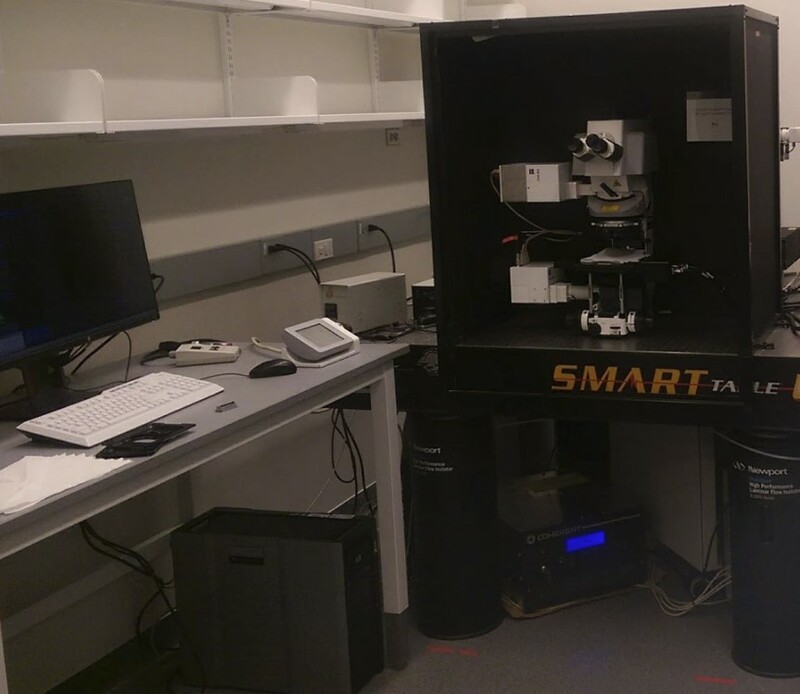 The LSM 710 microscope is a fully automated microscope that can be used for confocal and spectral imaging. The system is fully equipped for live-cell imaging. 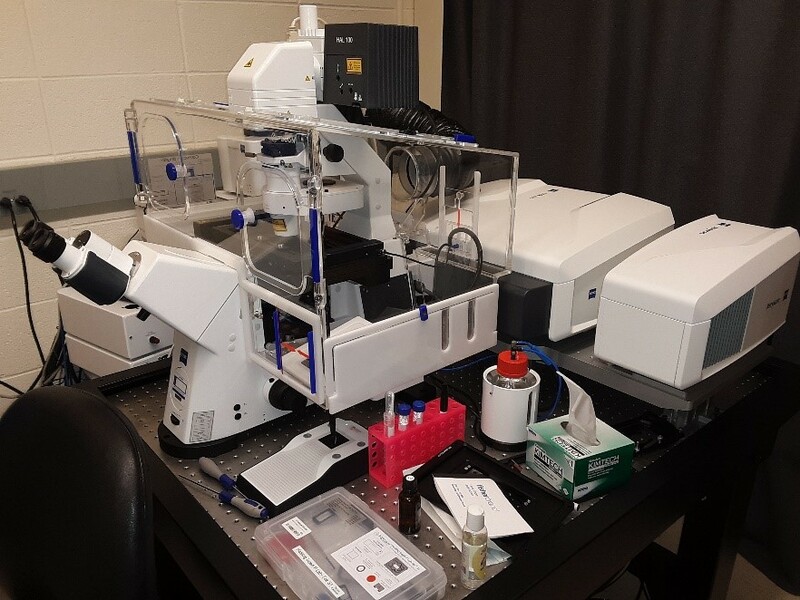 It has an environmental enclosure (temperature, humidity, and CO2 control) and z-drift correction to maintain samples at the focal plane over time. Laser lines: 405 nm, 458 nm, 488 nm, 514 nm, 561 nm, 594nm, 633 nm. Detectors: a 32-channel spectral multi-alkali PMT (i.e. ChS in Zen), two multi-alkali PMT detectors (Ch1 & Ch2), two ultra-sensitive GaAsP PMT detectors (Gallium Arsenide Phosphide PhotoMultiplier Tube), and one transmitted PMT (T-PMT) for contrast imaging (Bright Field, Differential Interference Contrast, Phase). The Zeiss 5 LIVE DUO is line-scanning microscope and has all of the capabilities of a standard confocal. The high speed DUO detector is optimal for capturing fast cellular dynamics and can collect images at 120 frames per second. The META is a spectral detector that can separate fluorescent compounds with similar spectral profiles. A stage top incubator is available for live cell imaging.